In a short consultation it is often difficult for health staff to assess and advise patients on the best practice recommendations for their health. The HealthTracker electronic decision support system has been designed to help health professionals implement recommendations from trusted clinical guidelines. The first module, HealthTracker has now been developed and other chronic care modules are in early development stages. 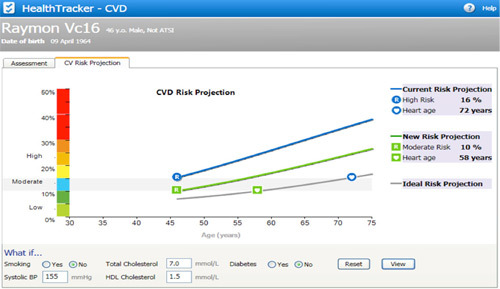 HealthTracker not only assesses cardiovascular risk but also provides direct treatment advice. Displayed in colour with easy-to-follow charts, the tailored output also makes it easier for patients to understand their risks and see what action they should take. HealthTracker interfaces seamlessly with Medical Director and Best Practice via the Pen Computer Systems PrimaryCareSidebar™. The system automatically extracts information from the patient’s health record. In two mouse clicks, HealthTracker calculates the patient’s absolute risk of heart attack or stroke and then automatically synthesises recommendations from all relevant guidelines to provide tailored management advice specific to the patient’s circumstances. A simple traffic light system is used to alert the practitioner to management recommendations. 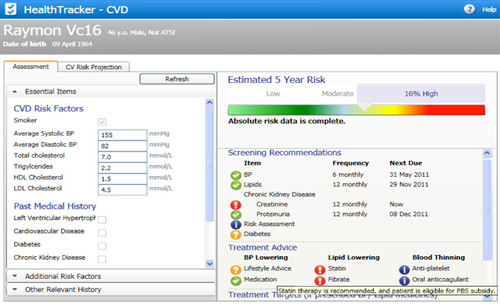 A graphical interface is also provided to explain to patients their cardiovascular risk. This allows the patient and health professional to assess current and projected risk and to perform ‘what if scenarios’ (eg the effects on future risk if the patient can stop smoking). This approach aligns closely with the work of colleagues from the University of Auckland. For more information see http://www.knowyournumbers.co.nz/heart-age-forecast.aspx and also Wells et al. Heart 2010;96:708-713. HealthTracker is also fully integrated with the Clinical Audit Tool™ and provides simple and comprehensive practice performance monitoring and quality improvement. The TORPEDO Study will implement the HealthTracker tool as part of a trial to improve cardiovascular risk management in 40 General Practices and 20 Aboriginal Community Controlled Health Services in NSW and Queensland. Smartphone: the answer for India's heart health?